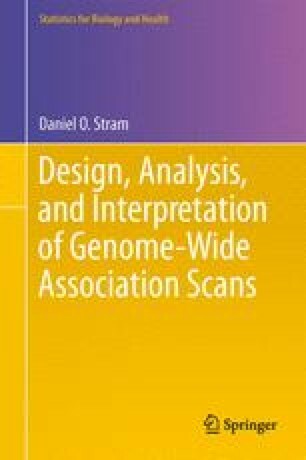 The term post-GWAS analyses here refers to two somewhat distinct general topics; first are a compendium of analyses that are typically performed after one or more GWAS studies of a particular disease have been completed. These analyses include pooled or meta-analysis used in order to combine results of two or more studies, typically with the help of the of large-scale SNP imputation as discussed in Chap. 6. Additional analyses include replication of results often found first in Europeans, in studies of other racial/ethnic groups. Discussion of this topic is broadened to include what has been called multiethnic fine mapping. Adjustment for local ancestry in studies of admixed groups, as an aid to fine mapping within a single group is discussed as well. Heritability estimation using GWAS data is also considered. A second set of topics are termed post-GWAS because they relate to issues raised by a new technology, namely, next-generation whole genome sequencing (WGS), which is currently being evaluated for large-scale association studies. The main raison d’être for WGS is to allow for interrogation of rare variation that cannot be measured on GWAS SNP arrays used to date. This chapter covers some of statistical topics related to the assessment of the role of rare variation, especially composite groups of rare variation related to each other through their mode of actions, pathway membership, physical location in or between genes, etc. The online version of this chapter (doi: 10.1007/978-1-4614-9443-0_8) contains supplementary material, which is available to authorized users.